September 25, 2017 — It was a hot Sunday in mid-September, a sweaty slap in the face after a long, glorious streak of cool days. We looked for somewhere to hide from it. 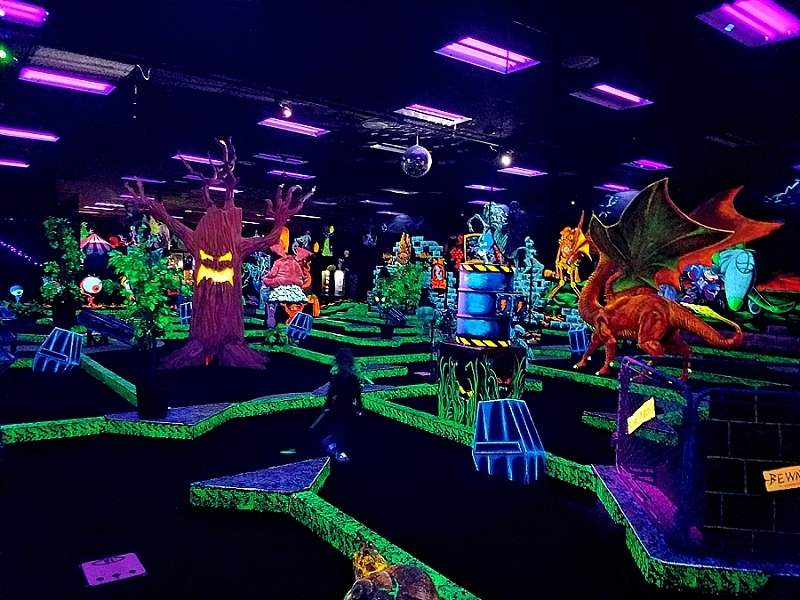 We dived into a cool, dark hole, where we found ourselves surrounded by neon glowing monsters...and 18 other holes. 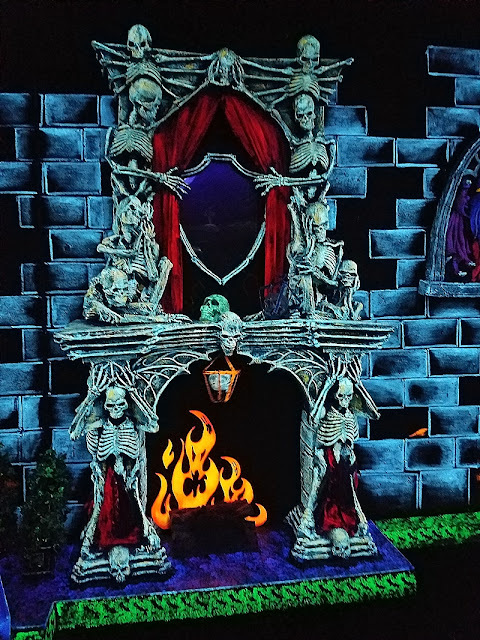 Monster Mini-Golf. Monster Mini-Golf is an indoor putt-putt course populated by black-lit monsters. That’s not a horror movie pitch. It’s a family activity. There are about two dozen of these across the country, including four here in New England. I'd always wanted to experience one, but just never got around to it. But I knew that when I finally did, it would be as part of the Halloween Season. And it was, and we happened to find ourselves at the course in Norwood, Massachusetts, which is a city just southwest of Boston. Walking into the building was a fantastic experience by itself. A real Alice-through-the-mirror deal. In one step and a door push, we went from bright, hot, ugly retail strip to velvety blackness shot through with glowing colors and leering faces. Once we got acclimated to the new color scheme of this reality, I was able to make more sense of the monsters I was seeing. 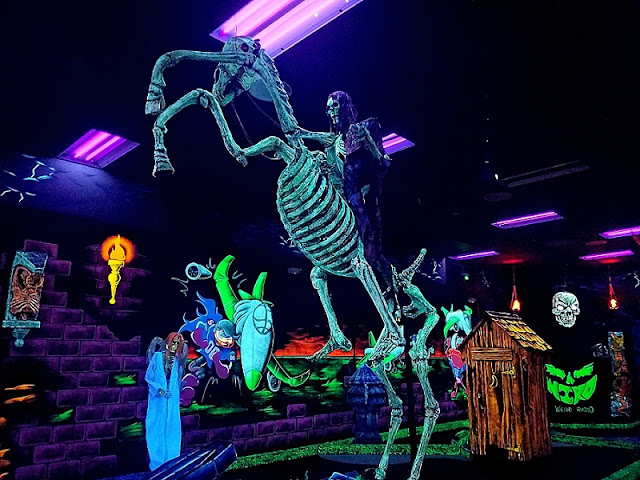 Like neon orange Jack-o's and a life-sized skeletal horse and rider. A pudgy pink demon with wings. A nine-foot-tall-orange jack-in-the-box ghoul. A large brown monster tree with glowing yellow eyes and mouth. 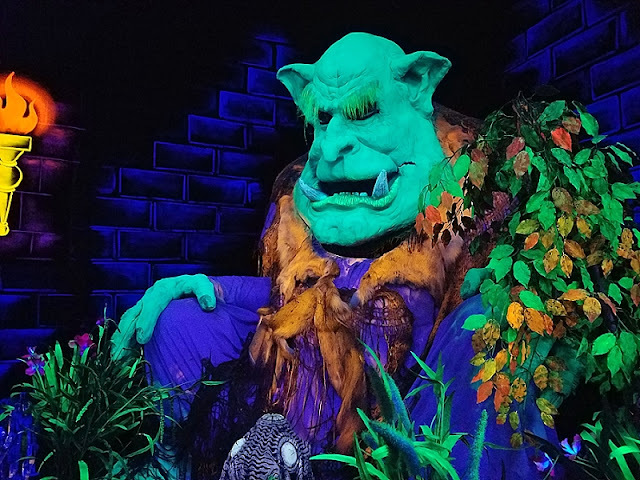 A green ogre the size of hill. An orange and red dragon. A fireplace made out of skeletons. A camel, for some reason. And that didn’t even count what was painted in two dimensions on the walls. But we had to experience these wondrous monstrosities and monstrous wonders in order, 1-18, with a metal clubs in our hands and glowing balls streaking across the black putting green. Ha. Black putting green. Said strange camel is in the background of this photo. I was there with my wife and two kids, who are seven and three. And it had been a very, very long time since I mini-golfed. Like possibly a decade. 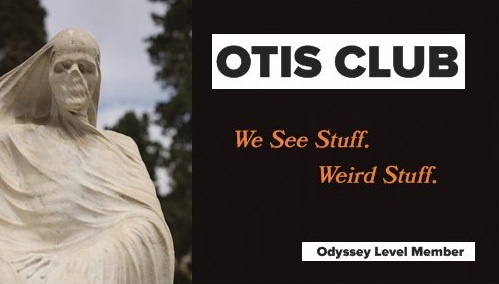 That’s probably why, after we were carefully measured for clubs like we were meant to fight the monsters with them and then picked out our favorite trippy color of ball, I also grabbed a score card. My wife just looked at me, her eyes zombie-like and dangerous in the black light, and I slowly put it back. And then we just kind of…didn’t play putt-putt. 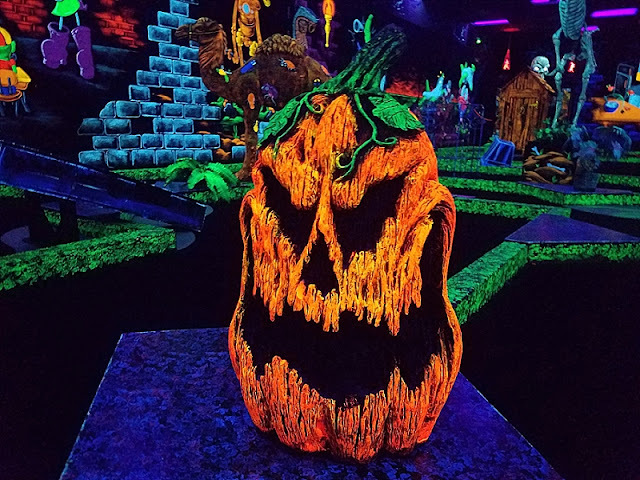 My seven-year-old dragged the ball with her club until it dropped into the holes, my three-year-old used the glowing green curbs as balance beams, I tried to figure out how to take selfies with the monsters (no easy deal since they were painted Day-Glo and I was not), and my wife was hitting balls onto the next tees (she’ll tell you that it didn’t happen, but it totally did and I have like 15 monster witnesses who will back me up). There wasn’t much interaction in the course. Every once in a while you needed to hit a ball beneath a monster, but nothing moved and nothing was really organically a part of the course. But none of it needed to be. I mean, I was never more than a par three away from a new monster at any given time. Finally, we hit the balls up a giant tongue and into a gargantuan clown face and were done. You should all find one of these courses this season and play it. Maybe get a year-long membership there. Perhaps throw all your birthday parties there. I want a cigar lounge just like this place. 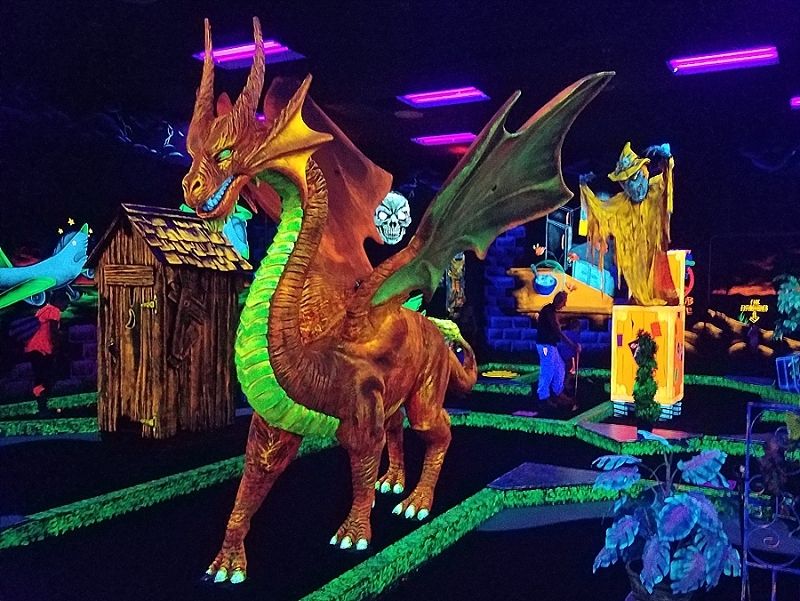 Of course, my whole-hearted Monster Mini-Golf recommendation is caveated, as level of experience varies with the course. 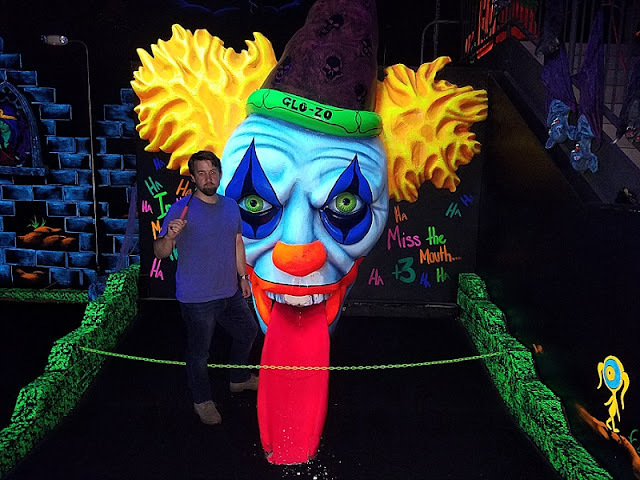 I once stuck my head into a different Monster Mini-Golf course years and years ago, the location of which I’ll keep to myself. Because it looked…boring. It had one or two cool monsters, but the course was crammed together into a small area, and it seemed as if the theme were perfunctory. As a result, I didn’t play. But the Norwood course was excellent. And I define excellence in this case by the immersive feel and the amount of monstrosity present. The other important aspect of our enjoyment of the place was that we virtually had it to ourselves. I think we inadvertently timed it for a Patriots game or something. 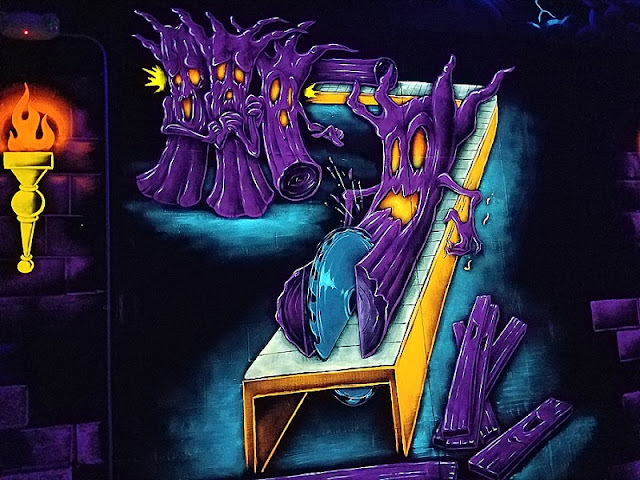 Putt-putt of any kind, monsters or no, loses a lot of its fun when you’re pressured at every hole by a backlog of players behind you. Plus, under those circumstances, I’d have to corral my family better. And in a land of neon monsters, that feels wrong to do.